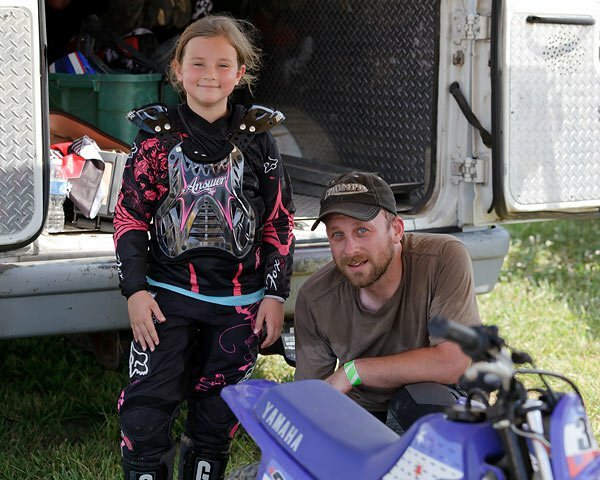 Breaking new ground, yet again, my 7 year old daughter and I went to the MX track. Neither of us have ever been. First timers ride, cheese, click, repeat. 95 degrees is not too hot to moto, but pretty close. 42 years old is not too old to try motocross for the first time, but pretty close. I was whipped. Between getting my daughter on track and supporting her, and getting my sorry self on track and trying not to auger into the earth, I ended up one very tired puppy. But I loved it, and so did she. You are a lucky man, what a beautiful child (and adventurous). The skills, character and dexterity she gains from riding will help her throughout her life, not to mention the experiences you both will have that she will cherish. I had a girlfriend who used to race moto-x in the eighties when she was an adolescent, which was extra tough at that time as guys didn't take too kindly to the chick that would beat them on the track from time to time. As an adult when I knew her, she was very successful and beautiful and was one of the fastest canyon riders I knew in the mountains of Los Angeles. Guys still didn't take kindly to her being faster than them, but she learned to handle them with grace and aplomb before and after bruising their egos. Good memories. Go get 'em Banda and daughter!